Is your patio looking worn out? Is it just a sea of concrete? Don’t worry. There are things you can do to make your patio a great extension of your home. Whether you decorate the concrete with a pattern or surround the area in beautiful plants, there are ways to update your patio. This is such an easy tip. You can purchase a product that allows you to redo your concrete patio in a new color. You can do the entire area in the new color or you can tape off areas to create a pattern. For example, if your patio is gray, you could do a charcoal gray stain over the light gray to create a beautiful pattern. You can also use stencils. You can even use two different colors of stain, if you like. You can also cover your concrete patio with stones or pavers. This will take a bit of time as you want to lay out a design that is pleasing to the eye. You want to start with a layer of sand, lay out your pattern, and then spread sand to fill the cracks between the stones or pavers. It’s a lot of work, but it gives you a great look. Check out some of these examples! If you have railing around your patio, you can do several simple things to make it look better. You can paint it, install solar lights at the corners, and hang planters. If your patio doesn’t have railing, or the railing is shot, consider adding new railing that has a modern look, such as railing that is made with thick wire. If you have a wood patio, you can find products that will allow you to bring life back into your patio. It completely restores the look of the wood so that you don’t have to replace it. You want to make sure to follow the directions exactly to get the best results. A rug can make your outdoor space feel like an extension of your home. You can find a number of outdoor rugs at your local home improvement store. These rugs are washable, can withstand the weather, and come in a variety of colors and styles. Last, but not least a container garden is an easy way to bring color to your concrete patio. You can line the patio in beautiful planters filled with your favorite flowers, evergreens, and plants. 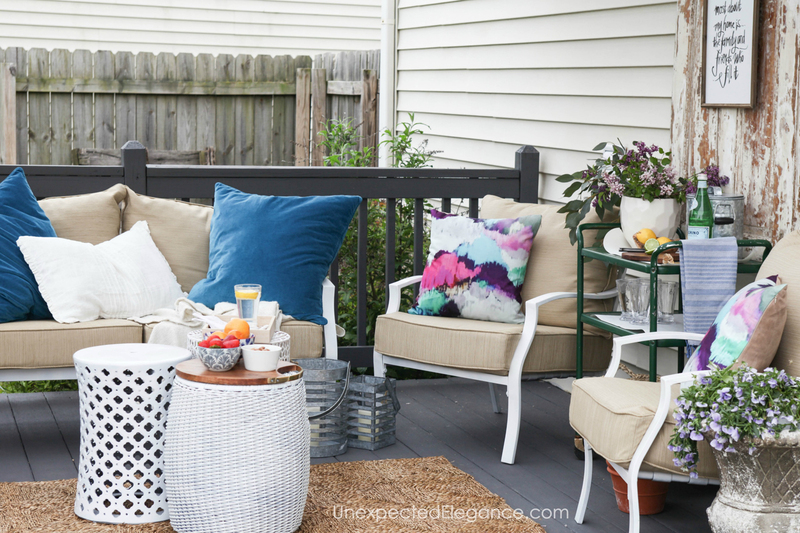 You’ll be surprised at how beautiful your patio can be with this simple tip. 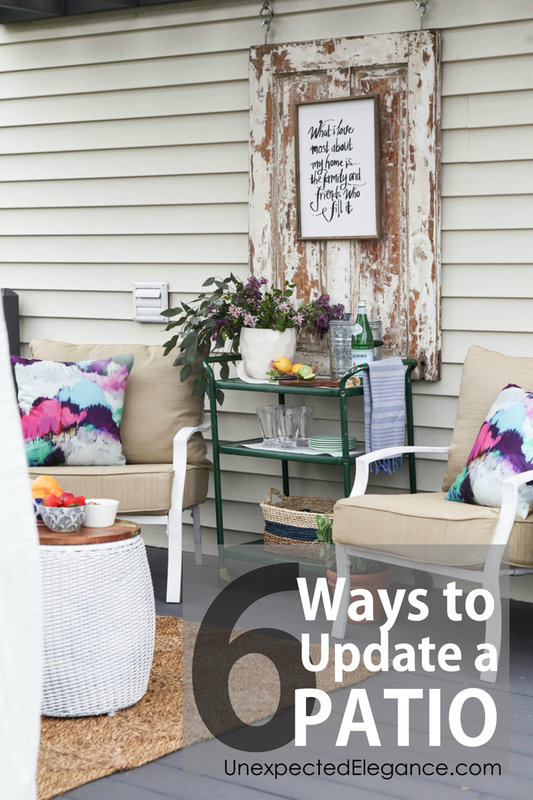 There are so many things you can do to update your patio. Whether you refinish the wood to restore the look or add interest to the railing, you’ll love the new look of your patio. Updating the railing is smart. It may be a simple task, but it can make the whole think look much better! And, if you decide to repaint or refinish it, it can look like new! Then you won’t have to worry about getting a new railing installed. I am a little skeptical about staining the concrete or adding my own pattern. I know it seems harmless, but I am just worried I will make a mistake that I won’t be able to undo. Can you upload a new post describing the process? I would greatly appreciate it! love your style of writing. quick and to the point. all excellent ideas. we specialize in pergola patio covers so always great getting new ideas! These are great ideas. Changing the color of the flooring is MAJOR! I love the grey you have here. Does it weather well? We’ll need to re-do our deck next year so I’m trying to figure out how to change things up!